You can get detailed stats and video of the game at ESPN, and check out a great photo gallery at the News & Observer. This entry was posted on at 11:22 am, filed under Sports and tagged Awesome game, basketball, Blue Devils, Cameron Crazies, Carolina, college, Duke, UNC. Bookmark the permalink. Follow any comments here with the RSS feed for this post. Both comments and trackbacks are currently closed. while I am still a Duke fan, it’s hard to pull for this team sometimes. having said that, I hate Duke fans. typified by 1.) the students, who repeat the same stupid chants year after year, each time getting lamer and lamer until it loses all effect 2.) an older bearded man with glasses who works for duke and/or lives in the woods and thinks he’s smarter than everyone else but is socially awkward, 3.) his ugly and/or fat pimply-faced kid. having said that, I also hate carolina fans, who are just generally stupid. 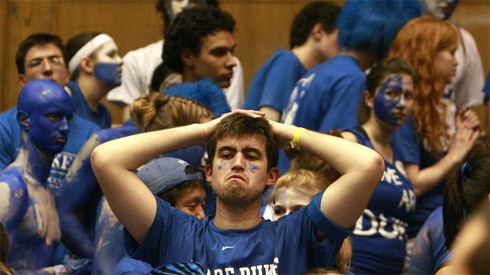 I still consider myself a Duke fan, but I certainly have become more apathetic since going away to another college. Duke kids are overly sheltered spoiled brats. UNC fans, unless they went to UNC, are usually rednecks. A lot of them just like UNC cause Duke is private and “rich”, and they neglect that UNC has respectable admission standards as well. The class divide isn’t as big as people want to make it seem. I still get the feeling that you’re “cool” to be a UNC fan, and “smarter/better” to be a Duke fan, but I really just want to punch everyone in the face. What should I write about for tomorrow? For those who care, HBO is airing a special Feb 23 @ 9 pm on the UNC-Duke rivalry. Website here.